Floral design is an integral part of every Preston Bailey event. The Preston Bailey Fundamentals of Floral Design program, Part 1 in the Floral Design series, is an opportunity for students to learn the fundamentals of floral design from Preston Bailey, the industry’s most highly regarded floral design expert. The course is designed for beginners who have no experience with flowers, flower arranging, or floral design. Students learn the tricks that every good professional floral designer depends on. They also gain a strong foundation in the basics, which prepares them for learning the more complex techniques of Preston’s unique floral designs. Students who complete this course also have the unique opportunity to apply for internships with Preston and his team at Preston Bailey Designs. 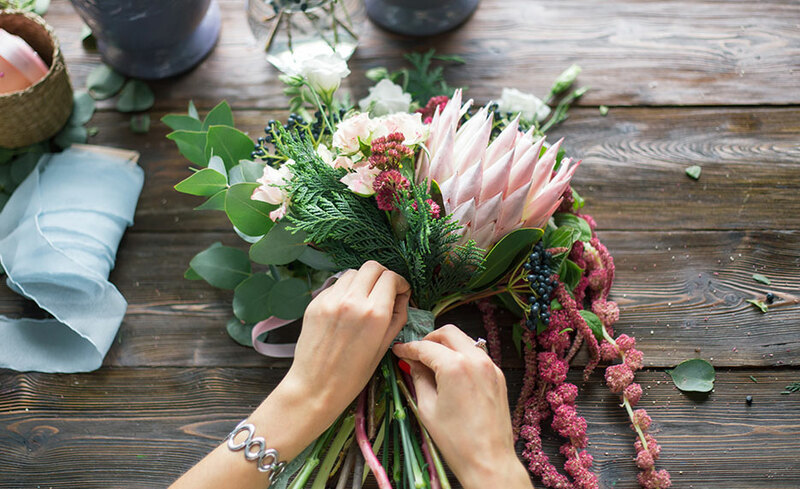 In this course, learn to identify, recognize, and understand how to use the tools of floral design. Learn the fundamentals of floral design from Preston Bailey, the industry's most highly regarded floral design expert. This program is for beginners who may have no experience with flowers, flower arranging, or floral design. This course walks students through all the steps needed to become a professional florist or floral designer. Students who complete this program will be able to establish themselves as professional florists. This course provides the tools, techniques, floral encyclopedia, and wholesale ordering tips that will help any student launch a business in the floral industry. In this program, students will also learn how to identify, approach, and set up an internship in their local area. They will receive notices of internship opportunities and industry conferences and events. Customized internships are set for each graduate that applies. There is a $95 application fee, and students are required to submit a cover letter and resume with each application. Each student will then participate in an interview with Lovegevity Wedding Planning Institute (LWPI) prior to participating in an interview with a potential internship host. Microsoft PowerPoint is recommended but not required (not included in enrollment). We recommend that you take Certified Wedding Planner and Preston Bailey’s Signature Wedding & Event Design prior to enrolling in this course. Angie Zimmerman is the CEO and founder of Angie Zimmerman Designs, a full service floral design firm specializing in weddings and special events. Angie has over 20 years of experience in the floral industry operating floral shops in multiple locations from San Ramon to El Dorado Hills, CA. Angie obtained her Bachelor of Science Degree in Organizational Behavior from the University of San Francisco in 1989. Currently, she operates her floral design company out of El Dorado Hills, CA and is the instructor and author of Preston Bailey’s Fundamentals of Floral Design course offered by The Wedding Planning Institute and the lead instructor for Preston Bailey’s Intermediate Floral Design. 12. Once I complete a course, do I receive a certificate? Yes, you will receive a certificate that you can display from Preston Bailey and The Wedding Planning Institute.